And, look like they were part of the original design and construction process. How can you make sure your replacement windows and patio doors are the best ones you can buy for your home? It starts with checking performance labels and non-affiliated third party industry ratings. If you want to know which replacement window is best suited to take advantage of solar heat gain during the winter, or built to filter out harmful UV rays that prematurely age your furnishings and artwork, visit sites like Energy.gov and the National Fenestration Rating Council to learn more about energy efficiency performance rating standards in general and read this article to learn more about industry standards for New Jersey and New York, in particular. Looking for convenience and low-maintenance replacement windows styles? Look for tilt-to-clean and lift-out panels that make it easier to clean your windows by enabling cleaning the outside from the inside. And, pop-off interior window grills eliminate the chore of cleaning around decorative elements. Optional locks and latches improve safety and security, while some styles have multi-point locking systems that improve energy-efficiency and home security. And, although not all replacement windows are built with insulated glass and dual-pane technology, modern, high-performance replacement windows are designed with gas-between-the-panes and precision built spacers that enhance energy-efficiency and reduce noise transfer. Choosing the proper glass can ensure exceptional light flow, easy care windows, reduced noise transfer, a better view, less UV light streaming in, natural heat gain in winter, and increased home security. Talk to your Renewal by Andersen of New Jersey and New York Metro representative about any performance concerns you have before you start talking about appearance. Now that you know some features that enhance performance, like glass, overall design, and construction processes, let’s talk appearance. While there is nothing wrong with replacing a double-hung window with a slider, or a casement window with a large fixed window unit, if you want to maintain the original characteristics and overall aesthetic in your home, try to replicate the window styles as closely as possible. Match the operating style hardware, accessories, and frame width as closely as you can. Many renovators today claim you should always replace aluminum windows with aluminum, vinyl with vinyl and wood windows with wood windows. However, composites like Fibrex, effectively match the original look of wood, but are virtually maintenance free, eco-friendly and often less expensive than custom-built wood windows and last many years longer than windows with metal frames. You never have to sacrifice beauty for performance, or vice versa. 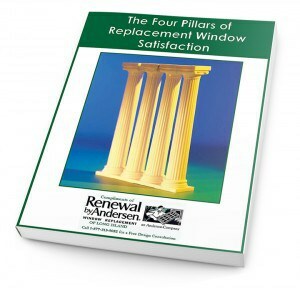 If you need help comparing replacement window styles and features, please let us know. Just fill in the short form on this page or call 1-888-826-2451.